We have discussed how Time and Space are the fundamental dual dimensions of the Brahman, two aspects of the same Conscious- Force, which in their intertwined interaction, provide the field and matrix for the manifested mode of the Brahman. The Brahman or Being has also an ‘unmanifested’ mode, a transcendental consciousness that is ‘indivisible’, ‘unitary’ and beyond Space and Time. It is ‘perfectly perfect’ because it has no division. We find it difficult to understand the motivation of its existence though mystics believe that the unmanifested mode of the Being exists for its own self-gathered rapture or ‘Bliss’or may be for nothing - for zero -- a perfect Nihil! (A) PROGRESSION - The principle of progression automatically implies a movement that naturally can only manifest in the matrix of Time and Space. Progression means not only a movement from the unmanifest to the manifest but also a movement towards higher and more complex realizations. “If the Divine had not conceived His creation as progressive, there could have been from the beginning a beatific, immobile and unchangeable condition. But the minute …. How shall I explain it, I don’t know. Just because the universe had to be progressive, perfect identity, the bliss of this identity, the full consciousness of this identity had necessarily to be veiled otherwise nothing would have ever stirred. A static universe may be conceived. One could conceive of something which is “all at one and the same time”: that there is no time, only a kind of objectivisation - but not an unfolding in which things manifest progressively one after another, according to a special rhythm; that they are all manifested at the same time, all at once. Then all would be in a blissful state and there would be no universe as we see it, the element of unfolding would be missing, which constitutes… well, what we live in at present. But once we admit this principle that the universe is progressive, the unfolding progressive, that instead of seeing everything together and all at once, our perception is progressive, then everything takes its right place within it. And inevitably, the future perfection must be felt as something higher than what was there before. The realisation towards which we are moving must necessarily seem superior to the one which was accomplished before. And this opens the door to everything - to all possibilities. When the unmanifested mode beyond Time and Space enters the manifested mode within Time and Space- the principle of Error appears. What was Unitarian; indivisible becomes divided, unequal, distributed so that a variegated multiplicity develops. The ‘perfectly perfect’ becomes imperfect, partial, skewed. What was gathered in a concentrated form in an eternal poise becomes diffuse, scattered, and distributed ephemerally in Time and Space. The inevitable consequence is that no one theory of life, matter, physical science, psychology, social science, religion, metaphysics, and philosophy can be perfect. Each such theory represents a partial truth equally important as other partial truths. That is why Freud alone cannot be complete, Einstein alone cannot be perfect, Communism alone cannot be the most ideal, a particular religion cannot be the last word, and a particular prophet or saint cannot be the only Divine messenger. The exaggerations of all these partial truths are a result of the ‘error- principle’ introduced by Time and Space. “79 - God is infinite possibility. Therefore Truth is never at rest; also, Error is justified of her children. 80 - To listen to some devout people, one would imagine that God never laughs; Heine was nearer the mark when he found in Him the divine Aristophanes. Perhaps he means that there is no error. Yes, it is the same thing, another way of saying the same thing. That is to say, what we call Error was Truth at a certain time. Error is a concept in time. Some things may really appear to be errors. The impression is this: all our judgments are momentary. They are: one moment, it is like this; the next moment, it is no longer like this. And for us they are errors, because we see things one after another. But to the Divine they cannot appear like this, because everything is within Him. Now just try to imagine that you are the Divine, for a moment! Everything is within you; you simply amuse yourself by bringing it out in a certain order. But for you, in your consciousness, everything is there at the same time: there is no time - neither past nor future nor present- everything is together. And every possible combination. He amuses Himself by bringing out first one thing and then another, like that. So the poor fellows down below who can see only a tiny part- they can see only so much of it - say, “Oh, that is an error!” In what way is it an error? Simply because they can only see a tiny part. This is clear, isn’t it? It is easy to understand. This concept of error is a concept that belongs to time and space. It is like the feeling that something cannot be and not be at the same time. And yet this is true, it is and it is not. It is the concept of time which introduces the concept of error- of time and space. What do you mean, that a thing is and is not at the same time? How is that? It is, and at the same time there is its opposite. So, for us, it cannot be yes and no at the same time. But for the Lord it is all the time yes and no at the same time. It is, like our concept of space; we say, “I am here, therefore you are not here.” But I am here, you are here and everything is here! (Mother laughs.) Only you must be able to leave the concept of space and time behind in order to understand. This is something that can be felt very concretely, but not with our way of seeing. Certainly, many of these aphorisms were written at the point where the higher mind suddenly emerges into the Supermind. It has not yet forgotten how it is in the ordinary way, but it also sees how it is in the supramental way. And so the result is this kind of thing, this paradoxical form. Because the one is not forgotten and the other is already perceived. And yet if one looks attentively, one has to think that the Lord is staging a fantastic play for Himself! That the Manifestation is a play which He is acting for Himself and with Himself. The Transcendental Consciousness beyond Time and Space is indivisible- it cannot even create. If one has an experiential realisation of that state, then ‘creation’ ceases to have any value to the psyche of the Yogi. What does that translate to the Yogi? It means one has come into contact with the unitary consciousness where division and therefore error is transcended. One transcends the errors of time and space. One transcends the world of dualities- of suffering, falsehood, ignorance and death. This can be regarded as a ‘perfectly perfect’ state - i.e. to say perfectly error-free, static state. “That is why if one enters the state in which everything, as it is, appears perfectly divine, one necessarily goes out of the universal movement at the same time. This is what people like Buddha or Shankara had understood. They expressed in their own way that if you could realise the state in which everything appears to you perfectly divine or perfectly perfect, you necessarily go out of the universal movement and enter the Unmanifest. This is correct. It is like that. They were sufficiently dissatisfied with life as it was and had very little hope that it could become better; so for them this was the ideal solution. I call it escaping, but still… It is not so easy ! But for them it was the ideal solution- up to a certain point, for….there is perhaps one more step to take. But it is a fact. If one wants to remain in the universe, one must admit the principle of progress, for this is a progressive universe. If you want to realise a static perfection, well, you will inevitably be thrown out of the universe, for you will no longer belong to its principle. 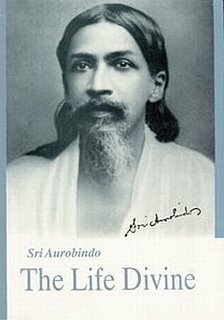 Sri Aurobindo’s solution belongs to another perspective: He accepts the fact that the hiatus between the Spaceless and Timeless Transcendent and the Creation within Time and Space has never been resolved satisfactorily. This is of course a credit to the Indian tradition that it did not opt for a simplified solution. Instead it brought in the concept of Maya that only emphasized the difficulty in resolution. This is because the ‘Oneness’ of the Transcendent Infinite belongs to a different perspective then the cosmic unity or even the summation or substrate of all that has been manifested. True, science seeks a substrate- unity in the fact that the basic building block of matter (the atom) is same throughout or the basic unit of life (the cell) is common in animate world. But the atoms and the molecules belong to the same perspective just as the zygote and the embryos also belong to a particular perspective. The ‘Oneness’ of the Transcendent that is beyond Time and Space and the ‘Multiplicity’ of creation within the matrix of Time and Space belong to two entirely different and distinct perspectives that cannot be equated, compared or made interchangeable with each other. In fact, the Transcendent, being beyond Time and Space and being indivisible, cannot even ‘create’! Sri Aurobindo approached this problem by positing the ‘Supermind’ as a status of Creative Consciousness situated between the Transcendent and the Creation. It conceives, carries and executes the creative idea with an ‘ordering’ Self-Knowledge. It subserves the knowledge of the unitary principle as well as the knowledge of the multiplicity without losing hold of the unity. It is the ‘Creator’, the ‘Master Artist’ that has projected this world. Unfortunately, the manifested world lost all contact with the creative source. This was however inevitable as this allowed each element of the multiplicity to develop itself to its fullest potential. Sri Aurobindo assures us that by a process of evolutionary growth in consciousness, the human being can ascend to the Creative Consciousness and make the Supermind an operative- principle in this imperfect world of dualities. The unity-principle can then be reconstructed in this world of dualities without rejecting the multiplicity (Buddha and Shankara opted for the same unity -principle but by rejecting the multiplicity). This is a concept that was not forwarded earlier and hence a victory that has yet to be achieved for humanity. Sri Aurobindo and The Mother by their yogic endeavor have however fixed the possibility and potentiality of this victory in the earth consciousness. (Ibid,Vol.8, pg.110, Conversation on 11 April 1956).